Everytime I see Jaws it gets better. I don’t swim in the ocean because of Steven Spielberg’s movie. Yes, I’m missing out on the sheer joy of frolicking in the surf. And, yet, I take comfort in the fact I’ll never have my torso severed in two by a fish. I love this movie. Most people consider it a horror movie, but really, it’s an adventure movie; albeit, one punctuated by a few excruciating moments of horror. Jaws is a miracle of editing, narrative pacing, and some of the finest character acting of the 70s. Roy Scheider as Chief Brody is absolutely perfect. His performance is deftly, profoundly complemented by Richard Dreyfuss as Hooper, the marine biologist, and Robert Shaw as the salt-weathered Quint, the hard-drinkin' shark fisherman. And those are just the three leads. This movie is alive with the lived-in faces of the extras and smaller roles. Amity feels like a real place, like you could step through the screen and into the street. Then, of course, there's the shark. In an era, when CGI effects are so egregiously overwrought, the actual physical animatronic shark, though clunky, has real physical heft and presence. It may not be a real shark, it may even look fake, but a dude is eaten by it and he’s not just thrashing around in front of a green screen. So, recently a friend told me that he’d read Peter Benchley’s novel and he boldly asserted that the book was better than the movie. Thinking he might be a jackass, I bought the book and read it. Turns out my friend is a jackass. The book is fun but what should have been a taut 200-page thrill ride, is a belabored, enough-already, 300-plus page diversion with aspirations to seriousness. Spielberg adapted it into an unrivaled masterpiece. For starters, in the book, Brody is from Amity. He grew up on the island, so there’s nothing unfamiliar about it. This is stupid. Spielberg makes Brody a NYC transplant who’s terrified of the water but trying to adapt to small town coastal life when the shark turns up on his beaches. That is brilliant. Brody is off balance, trying to find his footing from the start. One thing movies can do that books can’t is show, and allow the audience to hear, the real-life way human beings talk over one another. You can't write words over top of words. But you can hear actors literally speak their lines over the lines of other actors. Benchley drones on for pages about the town. Spielberg in the couple of tight scenes wherein the town council members and chamber officials chatter and jockey for position, brings Amity to vibrant life. This is the kind of smartly observed family dynamic Benchely can’t touch. Back to the marine biologist Hooper. He’s a yawn in Benchley’s version. In the movie, we get a smart, tenacious Richard Dreyfuss who bonds with the harried police chief despite their class differences. The two become friends, bonding over the challenge of cutting through Amity’s small town culture to solve their shark problem. From the minute Hooper surveys the damage of the first victim, and chides the selectmen that “this was no boating accident!” Brody’s on his side and so are we. That scene doesn’t even exist in the book, by the way. It’s no accident that Brody and Hooper swim off together at the end like Rick and Renault walking off into the night at the end of Casablanca. That classic friendship is deliberately echoed here. Spielberg makes a number of other brilliant changes to Benchley’s book too. Most notably with Quint. Benchely’s Quint is Ahab redux. All seafarin’ growl and piratey bluster. He introduces us to the character in a 5-page phone conversation. Spielberg gives us the nails-on-a-chalkboard entrance and the line “for that, I’ll give you the head, the tail, the whole damn thing.” Spielberg all the way on that one. The director also gives us the inestimably great Robert Shaw, who’s not the one-dimensional shark-hating psychopath of the book. By giving his Quint the monologue about surviving the sinking of the U.S.S. Indianapolis and the blue shark feeding frenzy that consumed hundreds of men, Spielberg humanizes Quint, gives him a context for his shark obsession, and tragically foreshadows his spectacular demise. 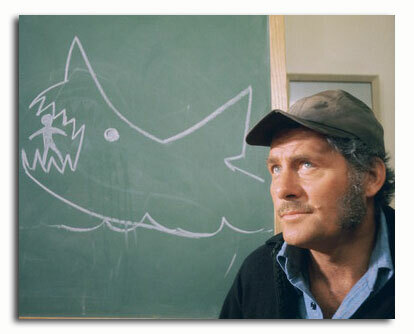 In the book, Quint drowns like Melville’s Ahab. Dumb. In the film, he’s devoured in gut-wrenching high style. I could go on. But let me end with this: in the book, Brody’s family is relegated to a few tossed off lines just to let us know he has one, I suppose. In the movie, he’s a father, his children swim and boat in these waters, and you can feel him weighing his every decision – how his every move might reverberate through the town or put his family in peril. After this Spielberg cuts to the Brody family dinner table. Everyone has eaten; their places have been cleared. Ellen is washing dishes while a dejected Brody broods in his chair. We know the death of the boy wasn’t his fault, but, being a decent human being, he can’t help but consider his culpability. He sighs and buries his face in his hands. When he peeks out from behind his fingers, he notices his youngest son, unaware of the true heft of his father’s burden, playfully imitating his every move. Brody plays along for a moment before he leans toward the boy and says “Give us a kiss.” “Why?” the kid asks. “Because I need it,” Brody replies, with the genuinely deflated air of a man beaten by a bad day at work and of a father seeking the affirmation of his child's love -- the child he is blessed to still have sitting across from him beautifully alive. I admit I cry every time I see this scene; and not because it’s some big, emotional moment. It’s just a small, sincerely realized moment of humanity. It’s the smallness of it that gets me – to see this truth played out: that sometimes, yes, indeed, a kiss from your child can cure many ills. But it’s also the mark of a director in supreme command of his craft, taking some thrilling, pulpy material and transforming it into something human and unforgettable. Johnny DiLoretto is a man of many talents. You can learn more about him and other Pencilstorm contributors by clicking here.